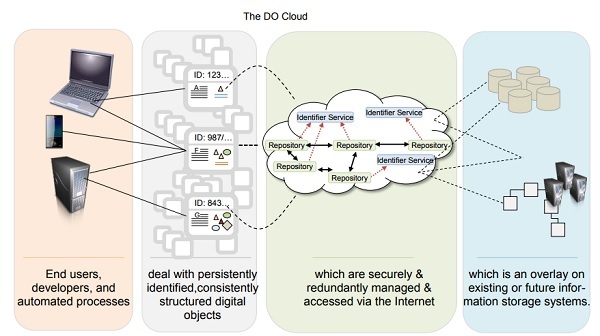 Have you ever heard of the Global Digital Object Cloud? It is now widely agreed in the Research Data Alliance (RDA) and beyond that concept of the “Digital Object (DO)” is central to proper data management, access and use. By the way, LIBER, the Association of European Research Libraries, and OCLC Research are launching a collaborative project to explore the adoption and integration of PIDs in European research information management (RIM) infrastructures (LIBER). A DO has a bit sequence that can be stored in multiple repositories and is associated with a Persistent Identifier (PID) and quality metadata. The PID, augmented with usable attributes about the DO, can provide identification, location, and other functions. Due to the claim of persistence, PID records are increasingly seen in a binding role, i.e., storing persistently all the necessary actionable references to the locations of the bit sequences, to the metadata (allowing proper interpretation and reuse of the bit sequences) and other useful information. This layer of virtualization of different components can be seen as the Global Digital Object Cloud (DOC), which is based on the ideas of a Digital Object Architecture and should be fully compliant with the FAIR principles. DOC model serves as a framework into which multiple lower-level data storage and management solutions can be placed as well as accommodating a wide variety of applications. In particular, such a model could guide work in the direction of a non-proprietary and highly efficient data management and access infrastructure where globally available and stable PIDs are anchors for all activities. The European Commission has recenty requested the FAIR Data Expert Group to develop a plan how the FAIR principles can finally be put into action and change our data practices, in order to support the Research and Innovation policy development on Open Science. To that end, the Group is working to develop an effective strategy that promotes data management planning (DMP) and sharing to enable reuse. Along with the principles of RDA Global Digital Object Cloud, this strategy will include the OECD principles, and the Royal Society concept of ‘intelligent openness’. When there are more and more data open and available through data repositories, it becomes ever more challenging for researchers to find relevant data. The Data Discovery Paradigm IG proposes ten recommendations with exemplar implementations to meet the requirements for effective data discovery. In today’s data-rich environment, with accompanying advances in computational and networking technologies, researchers increasingly conduct web searches to find research data. The success of such searches varies greatly and depends to a large degree on the expertise of the person looking for data, the tools used and, partially, on luck. This article offers ten quick tips that researchers can follow to more effectively and precisely discover data that meets their specific needs. A list of useful resources and examples from the article are listed in the final Resources section. The outputs of this working group (WG) will help in making systems interoperable and will allow for automatic exchange, integration, and validation of information provided in Data Management Plans, for example, by checking whether a provided PID links to an existing dataset, if hashes of files match to their provenance traces, or whether a license was specified. "...the turning point is the capacity of the RDA community to organically develop interfaces between groups, and streamline the inter-group communication"... that will take on the work of strengthening the voice and position of disciplines within RDA [read a subsequent paper published in the CODATA Data Science Journal, Genova, F. et al., (2017) Building a Disciplinary, World‐Wide Data Infrastructure. DOI: http://doi.org/10.5334/dsj-2017-016)].